Archbishop Oscar Romero is recognized as a model Christian, bishop and pastor. In his ministry in El Salvador he enfleshed the option for the poor. He is an inspiration to live simply that others may simply live and to defend the defenseless. On this, his Feastday, we ask for the courage to speak the truth boldly. St. Oscar Romero, pray for us! 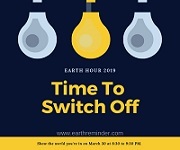 Consider joining with thousands across the globe in observing an hour without lights to help save energy. The AUSCP Friends Group now has 170 members. Please take time to invite your friends to join us! The majority of those who have become Friends have done so because of a personal invitation from an AUSCP member. Help us continue the important and critical work of the AUSCP with your financial assistance! You can click below to donate. If your parish tithes its Sunday collection and sends a monthly donation to various places please consider putting the AUSCP on the list of recipients. Thanks! Consider setting up an auto-renewal on your bank account. When you reserve your hotel room for the Assembly, you will see an offer for a Marriott Credit Card. If you have not had one within the last 2 years, you can apply and get a $200 credit on the card IF you make a purchase within 3 months. Then if you register for the Assembly online with your card, $200 of that $495 fee will be covered by your credit! Be sure to look at the details. Deadline Nearing for 2019 Assembly Registration Discount! Annual Appeal Has a Matching Challenge! A generous donor will match all gifts given between now and April 30th when the annual appeal ends. This is a chance to really push the Annual Appeal "over the top!" We set a goal of receiving donations from 350 donors and we are now at 324, so we are getting close! You can click on the "Donate Now" button in the left column, or send a check to: AUSCP, 200 St. Francis Avenue, Tiffin, OH 44883-3458. A primary focus for this year is expanding the voice of the AUSCP. Every donation, large or small, helps us toward that goal. Thank you to the 324 who have already responded! If you would be willing to facilitate a Table Discussion Group at the June Assembly, please notify the office at: office@uscatholicpriests.org. We are in need of 25 Assembly ‘Table Facilitators’. A Facilitator Guide will be provided. A special email was sent last month to announce that the time is here to surface new names for the AUSCP Leadership Team. No nominations have been received as yet. Please consider your gifts and see if they match what is needed to serve on the Leadership Team. Or, contact a priest friend and encourage him to submit his name. We welcome diversity in all areas - age, race, ethnicity, diocese, etc. Nominations should be submitted by April 15, 2019. The elections will take place at the 2019 Assembly, June 24-27, in St. Louis (Airport Marriott hotel). This year we have one member of the Leadership Team eligible for re-election and three who are completing two terms (2013-2016 & 2016-2019) and thus not eligible for re-election. Those who are completing two three-year terms are: Bob Bonnot, Kevin Clinton, and Jim Kiesel. Completing one term and eligible for re-election is Louie Arceneaux. We are grateful for the time and energy they have put into serving the AUSCP. "Synodality is about more than structures. It is about listening to each other. Synodality requires that we do not seek to 'win' an argument about what the church should do, so much as we, together, seek the Spirit's prompting and move forward together, always together. … Synodality is about much more than simply a different mode of decision-making. It is about putting childish ways aside and becoming adult Christian disciples. It carries forward the vision and the ecclesiology of Vatican II and, more importantly, of the Gospels." To join the call, go to: zoom.us/join or call 408 638 0968 and enter ID 5328291069. This webinar will be recorded, so later access is possible. You can access more information and short videos on this issue HERE. The deadline for answering the SurveyMonkey on a memorable name for AUSCP was March 22nd. If you have not answered it, you can still do so until Friday, March 29th, and your answers will be accepted. Join Bob Bonnot, AUSCP Executive Director, in conversation with Dan Misleh, founder and CEO of The Catholic Climate Covenant*, as they examine how the unmitigated effects of climate change are bound to increase the violence suffered both by humankind and all creation. The AUSCP Leadership Team is proud to help sponsor DignityUSA’s 50th Anniversary Conference, July 5-7, 2019 in Chicago at the Westin, Michigan Avenue. We will also staff a table at the event, which celebrates Dignity’s groundbreaking five decades as the world’s oldest organization of Catholics working towards justice, equality and full inclusion of LGBTQI people in our church and society. We encourage our members and friends to consider attending the DignityUSA conference. Because AUSCP is a sponsor, our members are entitled to register at the member rate—a significant savings. If you cannot attend the 50th Anniversary events, but would like to support DignityUSA’s mission, they have a special fundraising campaign to help launch a number of initiatives. Find out more and make your gift! As mentioned previously, the AUSCP sent two postcards to all priests listed in the Kenedy Directory to invite them to the 2019 Assembly in June. However, the printer made a mistake on the second card, so agreed to send a third one at their expense. This is the reason for proliferation of postcards. Please use any postcards you receive to invite others to the Assembly. Shop at http://smile.amazon.com/ch/45-3307327 and Amazon donates to Association of Us Catholic Priests. VISIT THE CREATOR MUNDI STORE: "Creator Mundi", an exhibitor at the 2018 Assembly, is supporting our mission. The AUSCP receives 12% of your purchase total every time you shop at the Creator Mundi Store, if you use code donateAUSCP when you place an order. (This is not a discount to the customer.) Click here to order. "Go, Repair & Rebuild My Church: Reclaiming the Priesthood of the Faithful"
Cardinal Blase Cupich, Archdiocese of Chicago: "Ordination does Not Annihilate Our Baptism"
Richard Gaillardetz, Joseph Professor of Catholic Systematic Theology, Boston College: "To Form a Priestly People - Toward a Non-Clerical Theology of Priesthood"
Sr. Norma Pimentel, MJ, Executive Director, Catholic Charities of Rio Grande Valley: "Today's Leaders in the Church"
Register by check by March 31, 2019 and pay $475. Hotel rooms are $115 per night, single or double occupancy, if booked by June 1, 2019. Use the link on the AUSCP website or call 314-423-9700.